Getting HereGetting to Mascher Space Coop on the El: Take the A Train (Market-Frankford Line heading East) to the Berks Street stop (one stop north of Girard). Walk straight forward, going west on Berks, and then turn left on Mascher Street. Walk past Montgomery, and you will see a building with a green metal awning. That is fidget. If you keep walking down Mascher, turn right on Cecil B Moore and the building is right there. Ring the doorbell! If you drive to us, there is free parking in the lot right in front of Mascher and along Mascher Street itself. thefidget spaceHoused in a 19th century, 4700 square foot warehouse in Kensington, thefidget space opened its doors in June 2009 as a research laboratory and hub for new forms of art, media, and performance in Philadelphia. thefidget space is a project of <fidget>, a platform for the creative collaboration of co-directors Megan Bridge (dance) and Peter Price (time-based media). 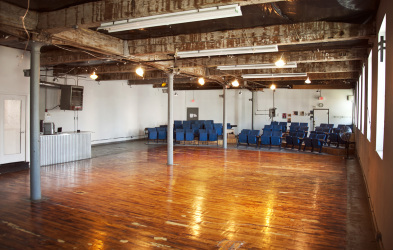 Through a presenting platform and affordable rehearsal space for dance and theater groups, <fidget> and thefidget space work to promote experimental and interdisciplinary art making and discourse. With a focus on immediacy of audience experience (imagine lounging on a comfy couch, sipping on a glass of wine, and watching a performance unfold a few feet in front of you), we aim to challenge conceptual paradigms in the arts and humanities and deepen thinking about culture and the nature of human experience. Mascher Space CooperativeMascher Space Co-op is a home for new dance in Philadelphia. Artist imagined, artist founded, artist shared and run, Mascher provides space that is affordable and versatile. We are a community of support that cultivates a flow of ideas and modes of deep problem solving and inquiry. Bound not by aesthetics, but a common commitment to working cooperatively and sharing administrative tasks and resources, Mascher wildly nurtures the development of its Artists-In-Residence at various stages in their careers, lines of research, and explorations.